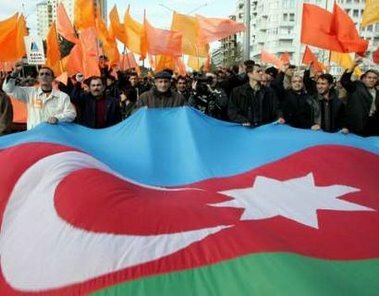 Azerbaijan Cries out for Freedom! 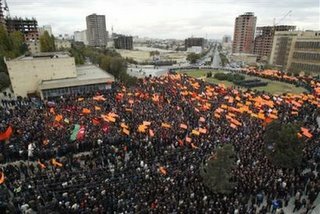 THOUSANDS PROTEST FOR DEMOCRACY IN AZERBAIJAN! Wearing Orange for Revolution, the People of Azerbaijan want Democracy and are calling out for support from “Mr. 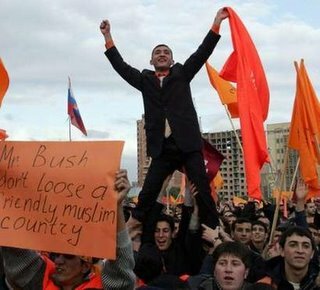 Bush!”! Thousands of protesters set off on a march through Azerbaijan’s capital on Wednesday, answering the call by the main opposition movement to come into the streets to defend their right to free and fair elections. The protest was the first test of the opposition’s ability to mobilize supporters following last weekend’s flawed parliamentary elections, and the movement hoped it would generate unstoppable momentum. An estimated 15,000 protested the election in Baku, the capital. 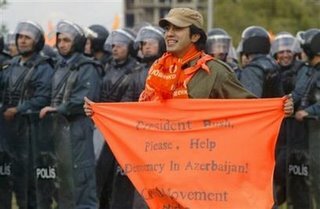 Publius Pundit has been following the situation in Azerbaijan closely. Robert Mayer has an update on the situation today. The Registan has been covering Azerbaijan (and has troubling news about Uzbekistan today).